Uglyworld #1977 - Mornings Cake Surprisers - (Project Cinko Time - Image 183-365), a photo by www.bazpics.com on Flickr. I successfullies managereds to evades Baz's grasps all days yesterday, so lasts night once he had gone to his beddies I fireds up the oven for stagers two of my makers up plan, cake bakerings! I makereds some cake callereds Marmor cakes, which is makereds up of two different coloureds bits of sponge cakers, and as you can probably imaginers, it is super tastiers! 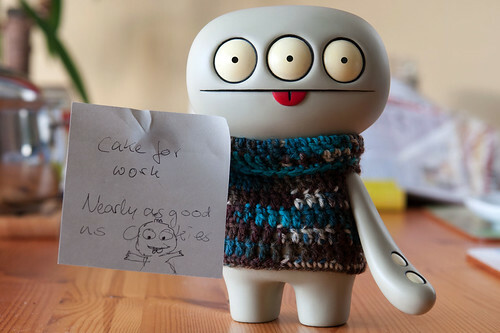 Once it was ready I cuttereds off a massivers chunk for Baz, and writereds him a littlers note to takes it with him to workies for when he needers some brain foods. Thankfullies I findereds that the cake was gone and onlies the note was lefts in the kitchen, so hopefullies my mornings cake surprisers will have done the tricker!